Gretna and Omaha firefighters were called to extinguish flames at a laundromat Sunday morning after the building exploded. 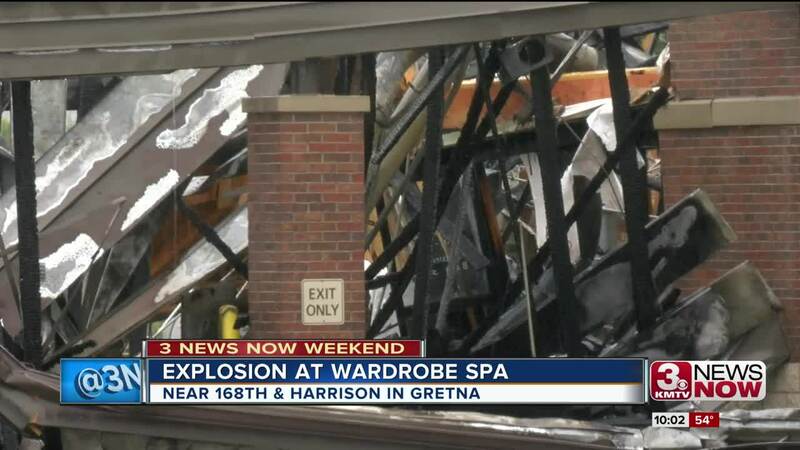 The Wardrobe Spa near 168th and Harrison was the site of the explosion. Fire crews worked through dreary weather to knock down the flames. Crews with M.U.D. were at the scene shortly after the explosion to turn off gas to the business. According to fire officials, the owner was at the property trimming trees outside at the time of the explosion. State fire marshals are still investigating the cause of the explosion, but plenty of curious neighbors drove by the laundromat after feeling it rock their homes. Kelley Steele, a nurse living a block away, sprung right into action thinking someone had to have been hurt. "It could have been way worse," Steele said. "[a] gentleman I talked to who was driving away from an ATM nearby said when he heard the explosion glass flew everywhere." Homeowners from the Cedar Ridge neighborhood said the explosion faced their neighborhood from the looks of the collapsed building. Heather Dall said she thought she heard a train derail because her backyard is right next to train tracks. "It felt like some explosion or derailment where there was a lot of impact because there's not that much that can shake a house that hard where it feels like it's moving off the foundation," Dall said. Employees from a pet store that sits across the street felt the explosion. That's where Brianna Rogers saw the owner walk outside moments before his business blew to pieces. "He was trimming the trees, he was previously inside, but he was making sure the front looked nice and he was behind a truck so when the building exploded he had some protection," Rogers said. An employee has created an online fundraiser for the Wardrobe Spa owners. State fire marshals are still investigating the scene overnight. Security is monitoring the property overnight.